Through three weeks, the Indians and Junior Blues have been the two top teams in the Centennial League. A week after escaping with a 21-20 overtime victory over Topeka High, Manhattan put together a complete performance in a 49-7 road win at Topeka Seaman. Senior running back Kevontae McDonald rushed for 192 yards and four touchdowns in the win over Seaman. Seaman tied the game at 7 in the first quarter, but Jaylynn Liggons immediately gave Manhattan the lead back with a kickoff return for a touchdown. McDonald (6-0, 205) has rushed for 502 yards and eight touchdowns. Junior back Isiah Childs (6-3, 190) has proven another capable option out of the backfield. Sophomore quarterback Dane Aschenbrenner has been efficient in completing 15 of 25 passes for 247 yards. His top targets have been Liggons, Javon Peoples, and Chace McIlvaine. On the other sideline, Washburn Rural has endured a touch schedule that includes road wins over Emporia (28-24) and Topeka Hayden (33-17), and a home victory over Junction City (34-24). The Junior Blues had to rally from behind to win their first two games against Emporia and Junction City. The Junior Blues are led by a ground game that features Jaylen Carter and quarterback Jordan White. Carter is averaging just under 10 yards per carry having rushed for 369 yards on 38 attempts. White has added 345 yards on the ground on 57 attempts. White has passed for 216 yards and two scores. His primary target has been Preston Williams who has nine catches for 93 yards and a score. The series has been heavily tilted towards Manhattan with the Indians beating Washburn Rural in each of the last ten years. The schools met twice in 2016 with Washburn Rural upsetting Manhattan in the playoffs, 24-21. For the third straight season, Derby and Bishop Carroll, teams that very rarely play each other, meet in a high-profile matchup. Derby has rolled this fall with victories against Garden City (49-6), Salina Central (63-0) and Newton (55-7). It marked the most points Garden City, known for defense, had permitted since Week 7 of 2014. Salina Central and Newton are a combined 3-1 when they don’t play Derby. The Panthers are Class 6A’s highest scoring offense with 167 points and rank third with just 13 points permitted. Quarterback Grant Adler and running back Tre Washington pace the offense, while safety Hunter Igo leads the defense. Against Newton, Adler tossed three first half touchdown passes and Washington ran for three scores. Derby has allowed just 45 rushing yards in the first three contests. Bishop Carroll has its third big matchup in the first month – and then travels to Great Bend and faces rival Kapaun Mount Carmel in the Holy War in the next two weeks. Carroll fell to rival Wichita Northwest, 23-22, on a last-second field goal in Week 1. After a 36-20 win at Wichita Heights in Week 2, the Golden Eagles defeated Wichita West, 49-20, last week. Quarterback Cade Becker has been banged up and is questionable for the contest. Backup John Honas played well last week. Tight end Clay Cundiff is a University of Kansas commit. Jackson Nichols is strong in the backfield, especially against Heights when he rushed for three touchdowns. Carroll has been solid in the return game, including a kickoff for a score versus Northwest. In ’16, Derby beat Carroll, 49-13, and last year, Derby won on the road, 54-45. Carroll has plenty of weapons, but the Panthers are asserting themselves as the state’s best team. An Eastern Kansas League showdown that not only features two ranked teams in Class 5A, but also the two state semifinalists from the east side of 5A in each of the past three seasons. Mill Valley and St. Thomas Aquinas have met eight times in the past five seasons with each team winning four of those eight meetings. The Jaguars will try and rebound from a 40-7 loss to Bishop Miege last week. Mill Valley opened the season with wins over Blue Valley West (35-24) and St. James Academy (14-13). After graduating all-state quarterback Brody Flaming, Mill Valley ahs turned to senior Jordon Preston who transferred from Lawrence Free State over the summer. Preston has completed 62 percent of his passes this season for 714 yards and three touchdowns. After an injury to senior back Cameron Young in the season-opener, the Jaguars have turned to Lansing-transfer Tyler Green. Green, a junior, has responded in rushing for 329 yards and four touchdowns. Senior receiver Logan Talley has 20 receptions for 228 yards in three games after catching 91 balls for 1,254 yards and 11 touchdowns as part of his all-state junior season a year ago. Aquinas has averaged more than 42 points per game in picking up wins over Blue Valley, Blue Valley Southwest, and Blue Valley Northwest. The Saints are doing what the Saints do under coach Randy Dreiling – run the football. Aquinas averages 415 yards per game on the ground led by sophomore sensation Tyron “Tank” Young. Young has rushed for 635 yards and nine touchdowns on 46 carries already this season. Returning all-state back Cameron Jackson is second on the team with 160 yards rushing on 16 carries. Senior quarterback Tate Raboin has completed half of his pass attempts for 266 yards and four scores. The Aquinas defense is allowing only 12 points per game. Seniors Bo Meisenheimer, Max Seibolt, and Zach Goodeyon are the team’s top tacklers, while defensive lineman Javier Derritt has 16 stops with 4.5 tackles for loss. Class 3A begins the new expanded district format this week, and there is no bigger matchup in District 1 than CNC rivals Galena and Frontenac. The Bulldogs and Raiders are two of the favorites to grab playoff spots out of a challenging District 1 that also includes traditional contenders Columbus and Caney Valley, as well as unbeaten Parsons. Galena has opened the season with three wins in dominating fashion. The Bulldogs defeated CNC members Riverton (52-6) and Girard (36-2) before last week’s 50-22 win over Prairie View. Galena features a veteran group in the backfield led by senior quarterback JC Shelton. Backs Joseph Helton and Kooper Lawson are physical ball carriers that help balance Shelton’s shifty play-making ability. The Bulldogs had to replace several starters up front from last seasons’ 11-1 team, but this year’s group has size and has played well thus far. Meanwhile, Frontenac has had a bit of an unusual schedule through three weeks. The Raiders opened with a 19-8 home win over Richmond (Mo.) before their annual Black-and-Blue game against rival St. Mary’s Colgan. Colgan defeated the Raiders this year, 14-0, in wet conditions. Last week, Frontenac traveled to Commerce (Okla.) to take on a traditionally solid Tiger program. The Raiders came away with a 26-0 shutout victory. Mark Smith’s Raiders returned only a couple of starters from last year’s Class 4A-II state runner-up team. The offense is led by quarterback Jake Beckmann, while Alex Johnson and Gage Clothier have taken over the bulk of the load in the backfield. Brendan Ishimura is a big-play threat on the edge. The key this week will be for Frontenac to match the physical play of Galena. If the Raiders can hold their own up front, they have the playmakers to take this one down to the wire. These two Heart of America rivals have played each once every year since ’04, sometimes twice. In ’14, Sedgwick won the regular season meeting, 44-12, then Ell-Saline took the playoff game 28-20 en route to a 2-1A state runner-up. Last year, the squads met up in a high-profile season opener than Ell-Saline won 31-21. In the first round of the playoffs, Ell-Saline pulled out a 44-41 victory. Both teams have superb multi-year starters at quarterback that are among the state’s best. For Sedgwick, senior Hooper Schroeder, a four-year starter, is expected to complete his career as the Cardinals’ all-time leading passer, a substantial feat considering the program’s prolific offenses under longtime coach Jeff Werner. Sedgwick has opened with three road games. The Cardinals defeated Whitewater-Remington (46-6), Wichita Independent (52-14) and Sterling (47-8). 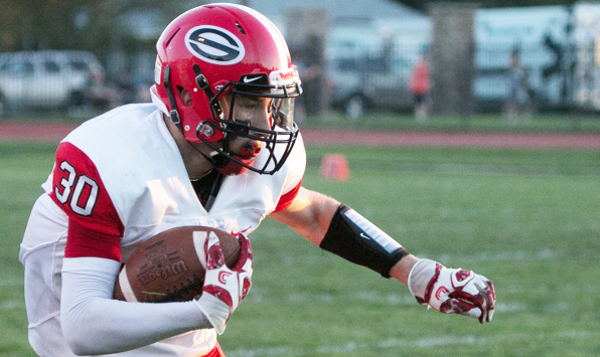 Ell-Saline features Nick Davenport, who has already received offers from Concordia (Neb.) University and Missouri Southern. Davenport, an excellent runner and defensive player as well, led the Cardinals to a 48-7 victory versus Sterling and 48-6 over Whitewater-Remington. Last week, Ell-Saline lost 8-6 to Hutchinson Trinity. Schroeder has averaged 354 passing yards a game. Overall, he is 55 of 89 for 1,063 yards with 12 scores against zero interceptions. Senior Colton Smith has 37 carries for 307 yards and four scores. Three receivers have between 11 and 14 catches and five have at least one receiving TD. Senior Eric Kohncke has delivered 38 tackles, eight for loss. Last week, Ell-Saline and Hutch Trinity engaged in a close game. Trinity scored early in the second quarter for an 8-0 lead. The Cardinals had just 83 first-half yards. In the fourth quarter, Davenport found Treyton Peterson on an 86-yard touchdown pass. Ell-Saline had the ball late inside the Celtics’ 35-yard line but couldn’t score. Davenport threw his first interception of the season and finished with 159 passing and 44 rushing in the loss. The Trinity TD marked the only score Ell-Saline’ first-team defense has allowed all season. Against Remington, the Cardinals led 34-0 at halftime. Davenport passed for 126, rushed for 62 and accounted for four scores. Longtime Ell-Saline coach Terry King often gives Sedgwick fits with his varied looks and schemes. This game will likely come down to the quarterbacks – Schroeder’s arm against Davenport’s dual threat ability. Ell-Saline’s defense, Davenport’s legs and physicality help pull out a victory. This marks the fifth time since the start of the 2016 season the Mid-Continent League rivals have played each other. In ’16, Plainville won the season opener, 20-16, and then defeated Smith Center in the state semifinals, 14-0, en route to a 2-1A runner-up showing to Troy. Both games were in Plainville. Last year, Smith Center won, 16-7, in a low-scoring turnover-filled contest in Week 1 in a matchup of top-five teams. Again the squads met in the state semifinals. By that time, the Redmen were rolling, defeated the Cardinals with ease, 51-0, and cruised to the 2-1A state title. Both games were Smith Center. This week, each team is 2-1 with a 28-point loss to Phillipsburg and similar scores in wins versus Thomas More Prep and Norton. These two squads could again meet up in the playoffs. For Plainville, junior quarterback Jordan Finnesy emerged as one of the state’s top dual threat quarterbacks last season when he exceeded 1,200 yards rushing and passing. This fall, he is 27 of 48 for 348 yards with a 6/2 TD/INT ratio. Finnesy leads the team with 48 carries for 228 yards. Junior Jared Casey, another one of the classification’s best players, has 47 carries for 214 yards and three TDs as the fullback. Plainville has averaged 7.4 yards per pass and 4.2 yards per rush. Junior Cody Crawford has five catches for 175 yards and three TDs. Plainville has four turnovers and is plus-2 in turnover margin. Finnesy already has three interceptions and a fumble recovery on defense. Senior Ryan Junkermeier leads the squad with 22 tackles, one more than Finnesy. Senior Tanner Copeland is one of the state’s best kickers with 9 of 9 on extra points and three field goals. Smith Center fell down 21-0 early against Phillipsburg and trailed 35-0 after three quarters before two late touchdowns. The Redmen will likely switch off with two quarterbacks: junior Trenton Colby and senior Rece Buckmaster. Colby is 5 of 6 passing for 65 yards and a score, while Buckmaster has been the better runner with 13 carries for 94 yards and a TD. Seniors Colby Benoit, Ethan Peterson and Hesston Maxwell lead with between 21 and 28 carries. Benoit has a team-high five rushing scores and 232 rushing yards, 10 more than Peterson. Smith Center has just two turnovers and is plus-five in turnover margin. Benoit paces the team with 28 tackles. Smith Center is at 6.3 yards per carry with 262 rushing yards a game and 5.6 yards per pass. Plainville has the edge in special teams and at quarterback, but Smith Center has more depth and likely gets the edge up front with experienced players like senior Austin Hobelmann and junior Joel Montgomery. The Redmen bounce back from its loss to Phillipsburg and win a close one. Kiowa County (3-0) at 8M-I No. 3 Hodgeman County (3-0) – Hodgeman Co.